Digital X-Rays are an essential step in treating dental problems. Mt. Horeb Dental in Mount Horeb, WI, offers digital x-rays. Dental x-rays have been used since the early 1900s. Today, it is difficult to imagine a dental practice without them. Dental x-rays play an invaluable role for an accurate diagnosis of dental problems. They provide a clear picture for the dentist which is necessary to provide diagnosis and treatment. Dental x-rays reveal cavities between the teeth or hidden by fillings, infections in the bone, fractures, gum disease, abscesses, cysts, and tumors. As with all technology, which is constantly improving, so are digital dental x-rays. Today, digital x-ray technology uses a special sensor to capture an image which is scanned instantly onto a computer screen and provides multiple advantages over traditional x-ray film. Most importantly, digital technology cuts the radiation exposure to the patient by 50-80%. Large and even color-enhanced images let you see what your dentist sees. This makes it easier for you to understand and make decisions about how your dentist will be treating your teeth. 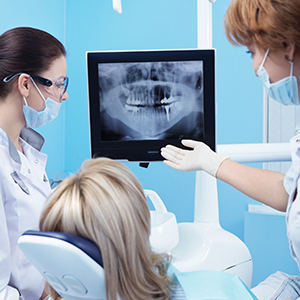 Dental x-rays are used for diagnosing, and treating problems. Whether a patient is in pain or is being seen routinely to prevent future problems, we need to be accurate in our diagnosis. Dental x-rays allow us to see issues that can't be seen with the naked eye and are necessary for providing the quality care we strive to deliver. While digital technology has minimized the health risks of x-rays up to 80%, it has not entirely eliminated it. At our office we make sure your safety is a priority. We are sensitive to your concerns about radiation exposure and we only perform those x-rays that are necessary for your continued dental health. If you have questions about why an x-ray is being recommended for you, please ask. About the same amount as eating 50 bananas. Go figure. A banana contains 0.1 microsieverts. A microsievert is the standard measure of the biological effect of radiation. One intra-oral dental x-ray exposes you to 5 microsieverts, whereas, a flight from New York to LA exposes you to about 40 microsieverts. If you live in a brick or concrete house for one year, you will be exposed to 70 microsieverts. Generally, we are exposed to around 400 microsieverts a year just from eating food. Radiation is everywhere and even when exposed to small amounts of radiation at the dental office we take all precautions to minimize your exposure amount by using the ALARA principle, which stands for “As Low As Reasonably Achievable,” when obtaining radiographs. This radiation principle limits your exposure by incorporating the following techniques: use of the fastest image receptor (that is, the fastest film speed or digital speed); reduction in the size of the x-ray beam to the size of the image receptor whenever possible; use of proper exposure and processing techniques; use of leaded aprons, and whenever necessary, thyroid collars.